HYTHE TOWN FC was formed in 1910, being formed from the ashes of another side in the town, Hythe Wednesday. 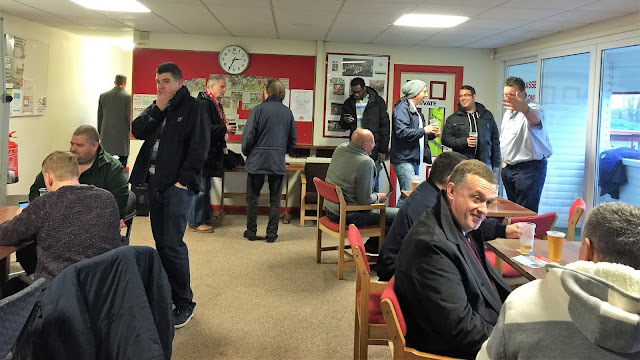 They were for a long time an amateur side playing in very local leagues, but in 1976 they joined the Kent League, as well as moving into their current home. A fair bit of investment by the then chairman Tony Walton saw the ground built up to Southern League standards and success followed on the pitch with them winning the Kent League title in 1989 and winning promotion to the Southern League. 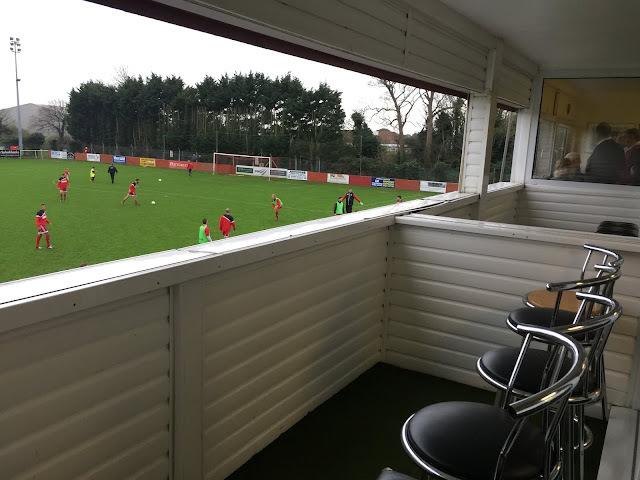 3 respectable finishes were not enough to stop the club from folding in 1992, but a new club, Hythe United took over the tenancy at the ground. Though they remained as an amateur outfit for the first few years, they soon made the step up to the Kent League, changing their name back to Hythe United at the turn of the century. After years of consolidation and near misses they finally won the league in 2011, to earn promotion to step 4. 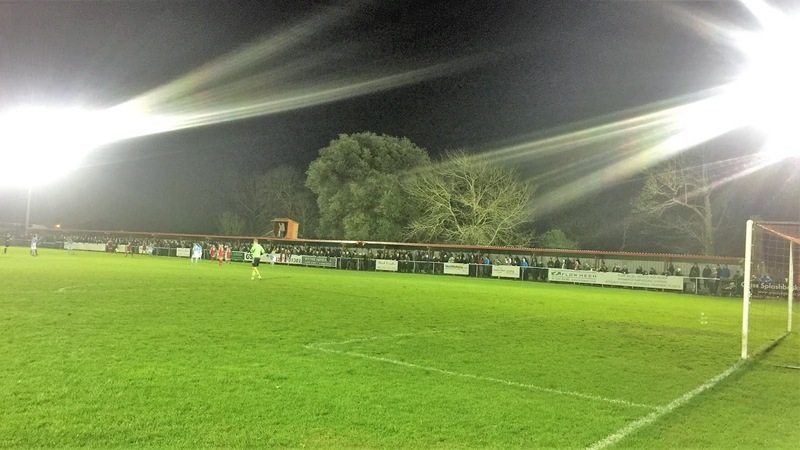 Since their last adventure at this level, the geographical boundaries had changed, and so it was the Isthmian D1 South that they won promotion to. 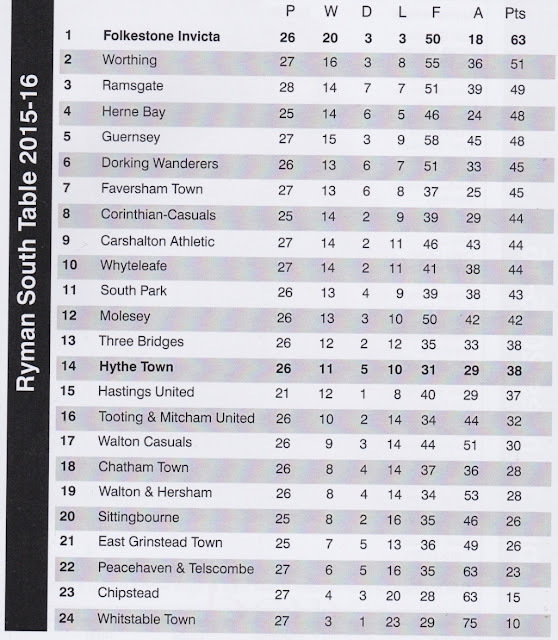 Their best season came in 2013 when they finished in 4th, but lost in the playoffs to fellow Kent side Faversham Town. Prior to this game, they were sitting in 14th place in the table. They reached the FA Cup 1st Round in 2011. Starting in the Extra Preliminary Round the beat Bookham, Deal Town, Epsom & Ewell, Erith & Belvedere, Concord Rangers and Staines Town. This set up a game against the league side Hereford United who promptly beat them 5-1. Though there has not been much progress in the Fa Trophy, it’s little brother the FA Vase has seen them have a number of successful seasons. The highlight came in 1990 when they reached the semi-final. Despite winning the home leg 3-2 in front of their record crowd of 2,147, they lost in Middlesex 2-0 to go out on aggregate. A number of local cups have been won, most recently the Kent Senior Cup in 2012. The town of Hythe itself once had Michael Howard as their member of parliament and he would go on to lead the Conservative party, albeit without success in a general election. Originally on this day, I'd been planning to stay at home with the family as we were having relatives around. That usually involves a fair bit of drinking and so with that in mind, I tried to get the next day off of work as I didn't want to be driving early after what would be a heavy evening. When my manager refused me it off, despite me doing the company favours on several occasions and being one of the few that does not go off sick whenever they fancy it, I thought of a plan. A football match in the afternoon would see me get home a lot later and see me fit for the 4am start. I'd still get to spend a bit of time with the family of course, and it would be nice to catch up. Choices were a bit limited but after careful consideration, I opted for Hythe Town v Folkestone Invicta as it was a decent local derby and a fitting game to visit what looked a very decent ground. I'd also get to see my Hythe and Gillingham supporting mate Louis, who I'd met briefly when I went to Ashford Town at the start of this year. Work wouldn't be a problem, usually, it's quiet at this time of year and in any case, I could get out at 12 at the latest. 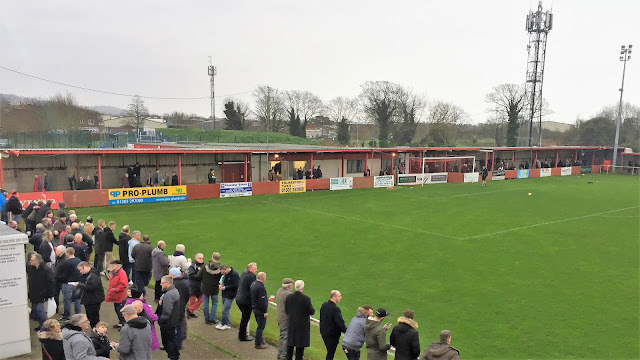 I'd actually been to Hythe's ground as a kid and even seen a game, even if it was a small sided game involving, amongst others, my cousin's team Capel Court FC as we were visiting them at the time. But as I didn't consider that a 'tick' I was going to do a revisit. On the day of the game, it was my first day back at work after 3 days off for Christmas. Thankfully the period between Christmas and the new year is always quiet and today was no exception with me out of work by 11. I was soon on my way and though the weather was gloomy and wet, I was in a decent mood. The journey started well enough, that was until I joined the M25 which was its usual deplorable self. I'm guessing that, just as one day Quasimodo will win a beauty contest, or one day Penn and Tylers Green might win the Champions League, I might actually circumnavigate the M25 without delay. Nearly an hour it added to my journey, but once I'd left and got on the motorways through Kent, it was all flowing freely. I got to Hythe at 1.45, going straight in. 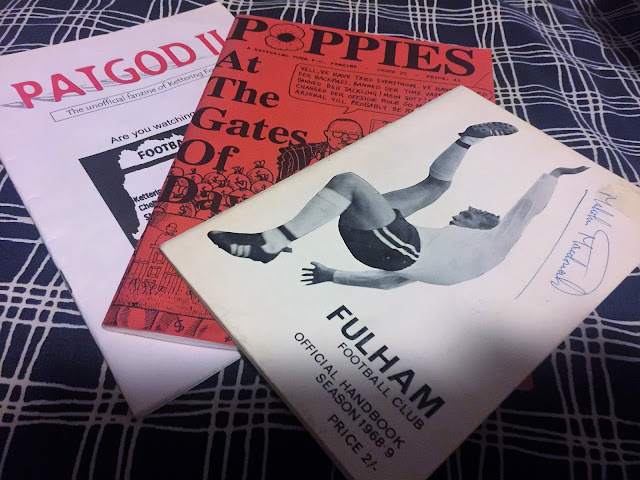 After getting some pictures I went to the club shop and got a few old bits, including a Fulham handbook signed by Newcastle legend Malcolm McDonald. 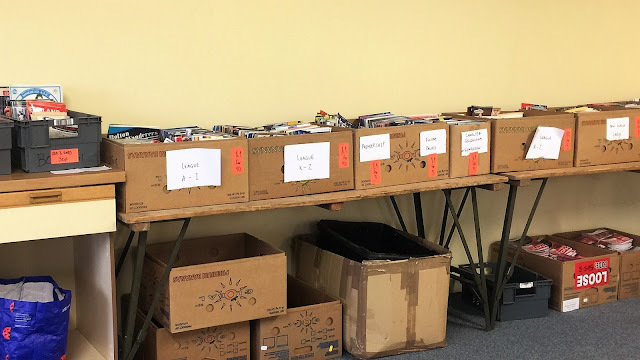 I had been hoping to get some programmes from Dover and Folkestone that I needed but they seemed to have every one but the one I needed. I met up with my mate Louis who supports Hythe, and also fellow hoppers Andy (from Sudbury) and Anders (from Drobak in Norway). After all the delays I had endured on the way there, I went up to the bar and got myself a pint of Thatchers Gold for £3.20 which helped me relax for the game. 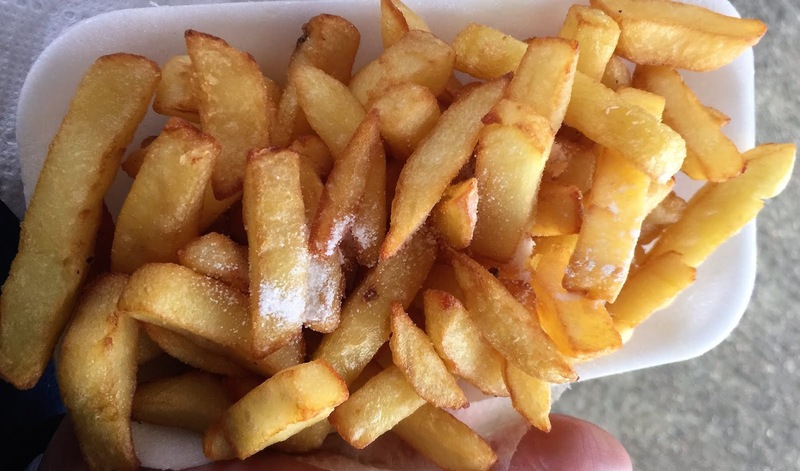 I then had a couple of portions of chips for £1.40 each before joining Louis behind the goal for the game. The kick-off had been delayed for 5 minutes as it was a bumper attendance. Hythe started by far the strongest, which made a mockery of the league positions. However, it was Folkestone that opened the scoring against the run of play with a dubious penalty which was well converted by Ian Draycott. 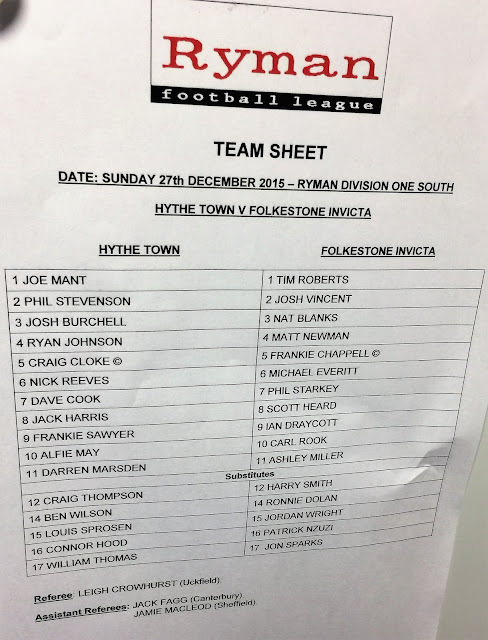 Hythe continued to be the better side but Folkestone were good at killing the game off, just as they were when I saw them in a dismal 0-0 draw when they drew at home to Leatherhead a few years back. 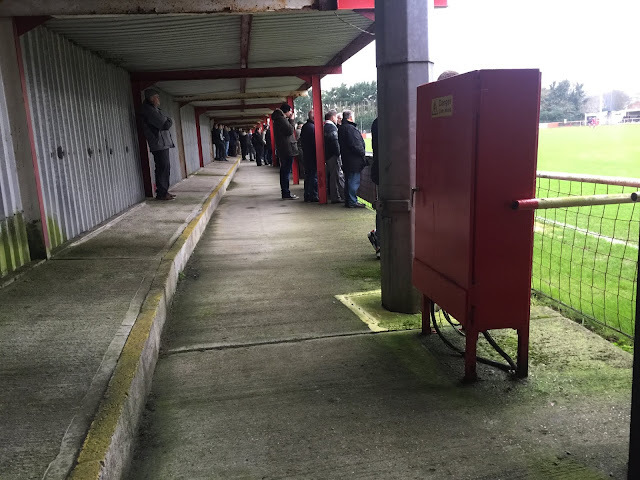 I found out that there were 1527 fans in the ground which is about 8 times the usual attendance down at Reachfields. 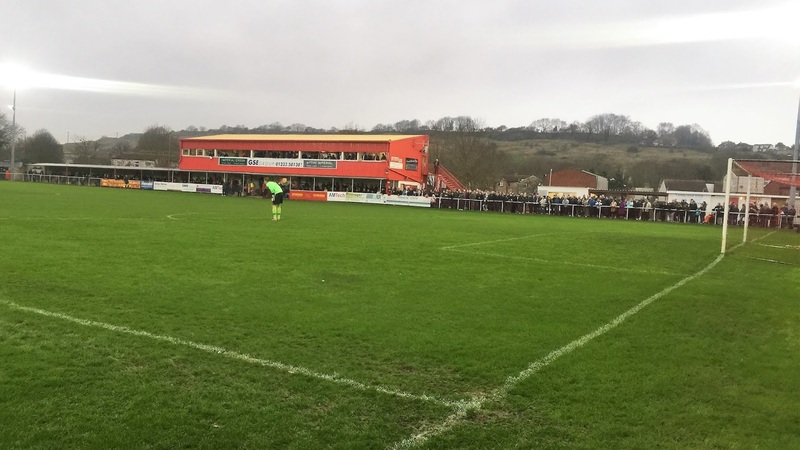 The hosts continued to have the better of the game but were continually delayed by a strong Folkestone defence. 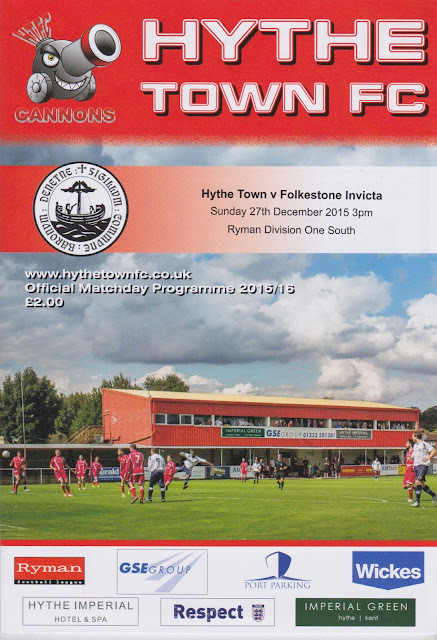 Hythe finally got their equaliser with 20 minutes to go - Frankie Sawyer with a mazy run through the box before finishing well, though the Folkestone keeper will have been gutted allowing the ball to go straight through him. Folkestone were reduced to 10 men on 78 minutes when Josh Vincent received his second yellow card. 6 minutes later Alfie May grabbed the winner with a close-range finish which was richly deserved. It had been a pulsating encounter in a great atmosphere, and I had met up with some good people too. The journey home was a lot better, with just a few minutes delay on the M25 and by 7 I was back home with the family, having a couple of drinks and catching up with everyone. REACHFIELDS STADIUM is a great stadium to visit and it has plenty of character. The focal point is the main stand, which also houses the bar and dressing rooms. This is unique in having a number of balconies which are like executive boxes, only without the window at the front. Some are reserved for directors but the remaining ones are available for fans to use at the cost of £2 per person. Underneath is a normal stand with metal benches, with a covered capacity of around 400. One end and a side have covered terraces, which could probably fit 2400 in at a push. Views from all these areas are good, while the remaining end is uncovered flat standing, with plenty of space behind to expand, should the need arise. One side is actually flanked by a MOD shooting range, with plenty of notices confirming this fact. 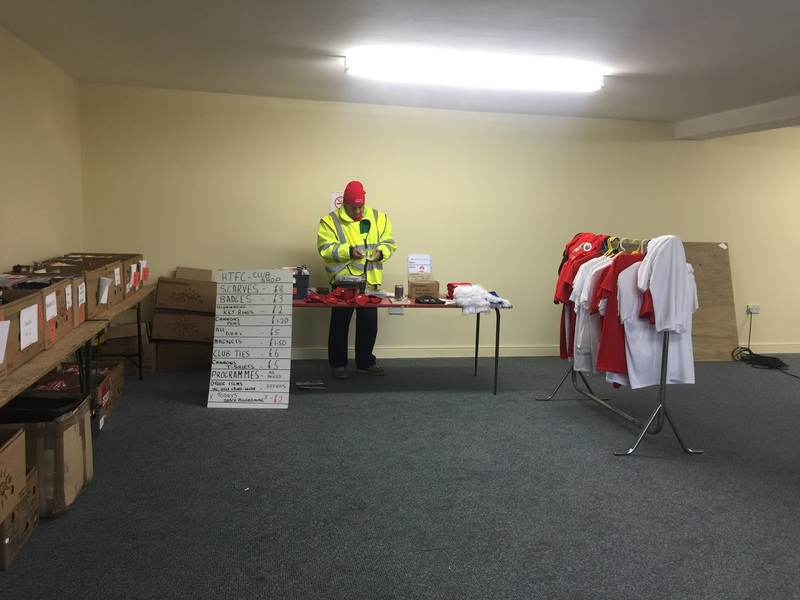 The club shop is a cracker, with plenty of old programmes and a reasonable range of merchandise. The bar does it’s job with a fair range, though it would have been nice for them to have a few bottles of local Biddenden Cider for people like me. The tea bar is very good, and the service is quick and efficient., with prices in line with other establishments at this level. I’d most certainly recommend a visit here, hopper or not. Everyone is very friendly and it’s a cracking ground. The town is not too far away, and if I’d have had more time, I’d have gone and checked out ‘The Three Mariners’ which has a range of local beers and ciders and is in the CAMRA guide. The programme is also a very good effort with lots to read in it.